Another momentous week, visitors, meeting new herbicide free workers and our campaign with-in the Shire gathering momentum. Shame though that personal and false attacks have been directed at those of us who have been steadfast in our dispersal of fact regarding the herbicides in wide spread use within the Shire. Its our responsibility to inform and as most of us are hands on, our role is to challenge when we observe bad practice. A sad reflection too on the state of debate, fact competing against vested interests. Unfortunately its a country wide reality. On the news last week we were told Monsanto and other chemical companies contribute millions to the pesticide watch-dog who oversees herbicide regulation. Read the introduction to Fred Pearce’s The New Wild. This sign has appeared at the turn off to our valley. Thanks to who ever has placed it. Its good to see others now getting involved and the silent dissent is becoming active. 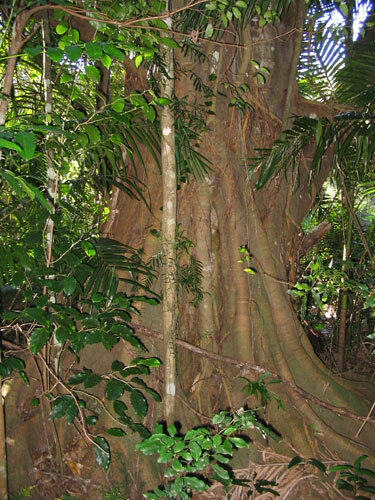 The photo below is of the trunk of a bangalow palm tree. I think its beautiful.